the case is now still going through Arbitration. Hopefully it will be concluded by the end of this year. In order to say THANK YOU to our Donors and Benefactors who could not be with us, we had a flag from their countries to represent them. The Police Band and City of Hope School Drum Majorettes were followed by the Grade 11 boys, who carried the flags. 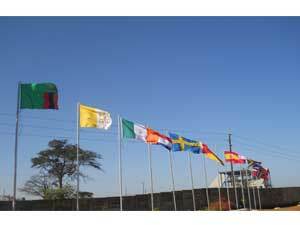 The flags from Zambia, the Vatican, Ireland and The Netherlands were placed in the front and the others were then taken back to the front of the school and raised on the poles. At the end of the function the four flags were also taken to the front of the school and raised. Our two main donors for the different phases of the School structure are from Misean Cara, Ireland and a Family Trust from The Netherlands. The Ambassador of Ireland was present, representing all the different benefactors from Ireland. 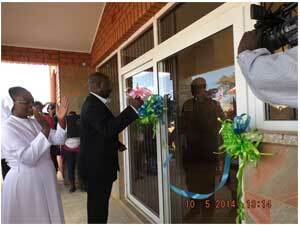 Mr. Joe Makano, local representative of Misean Cara gave a speech on behalf of all our Donors and benefactors. We are grateful to the different Embassies for giving or lending us the flags. The opening and closing prayer was done by Fr. Charles Mukuka, Rector of St. Bonaventure University – College. 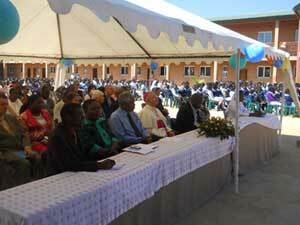 Archbishop Julio Murat, Apostolic Nuncio for Zambia and Malawi blessed the new school. He and his predecessor, Archbishop Nicola Girasoli have shown us great support from the beginning of this project and one of the songs sung by the girls of City of Hope was “Like a sunflower” in their honour to express our gratitude. 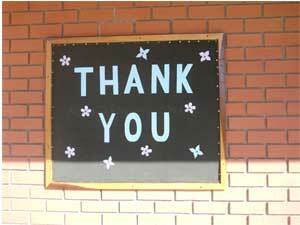 Other donors who supported the construction of the school, to whom we are most grateful are: The Salesian Mission Office, Spain, through the Rector Major of the Salesians of Don Bosco, Fr. P. Chavez; Symphasis Foundation, Switzerland; Don Bosco Mission, Bonn, Germany; The Anglican Bishops Appeal, Ireland; Tre Magi, Bologna, Italy through VIDES International in Rome; Swedish Caritas; The Irish Actor, James Nesbitt, through UNICEF and the Ministry of Education and the Salesian College, Farnborough, England. We are also grateful to Hans & Dora Erkeling of Don Bosco International; McKinsey & Co ,England; J.P.Mc Manus Trust, Ireland; Prof. Mayrhofer; the FMA Past Pupils Association, Rome and many Volunteers who helped towards the furnishing, Gate and Courtyard of the school. We are also grateful to potential donors who are looking into helping us to complete what still needs to be done. The Franciscan Conventual Brothers, Br. Derrick Bressey, Br. Joseph Kadsondo, Br. Martin Rouamba, Br.Kennedy Tsormey and Br. 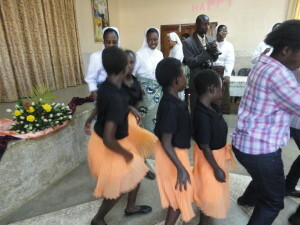 Francis Mulenga conducted and accompanied the singing of the girls who live at City of Hope. 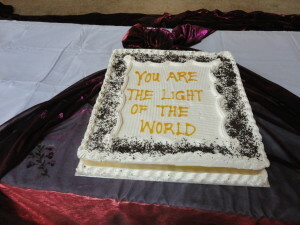 The girls sang songs that reflect the values we promote: New Hope, Colour the world with song, Fill the world with love, greatest love of all, we are the world and finally,” Give thanks”. Our Volunteers also played an active part: Meika playing the saxophone and flute, Silvie, Patricia, Agnieska, Megan and Royd taking the photographs and video clips. 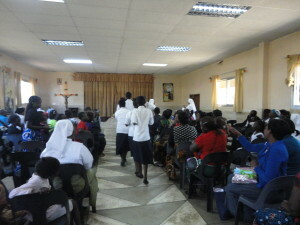 Representatives from the Ministry of Education, the PEO and DEBS and Representative of the Minister of Education, Sr. Lucy Rose, Superior of the General Council of the Salesian Sisters, Rome and Sr. Julienne Munyemba, Provincial of the Salesian Sisters were with us. Our Quantity Surveyors, Mr.Mtamira and Kabo Musyani, Sabelo Moyo, (Eng), Mr. Makayi from the National Council of Construction and Luciano Perrisinott (Eng) who oversaw the building were present. Mrs Renee Milner, MD of Pre-Secure, who has provided us with security for the last 4 years, Mrs Mary Hindson and Samantha Hindson, who are always helping us, Elder and Sister Lyle of the Jesus Ministries and Davis Shirtliff who have improved the water supply of the school and the project, as a whole were also with us. The Ambassador of Ireland and his wife, Mr. & Mrs O’Brien; Dr. Wisniewska, Honary General Consulate of Poland; Mr Thamanga, First Secretary of the South African High Commission in Zambia; Mrs. Klaske, friends and neighbours, as well as Religious Brothers and Sisters from different Congregations were present. Fr. Leszek Aksamit SDB, who helped us to oversee the first phase of the project was also with us. We are also grateful to the builders who were present for the occasion, the Teachers, also the parents and last but not least, the pupils. The Programme included speeches. 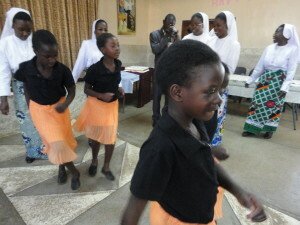 A cultural drance, performed by the pupils. Special thanks to: The Golden Bridge Hotel and Fairview Hotel who provided lunch to the special invited guests and Ndeka Hotel who provided soft drinks. The girls, living at City of Hope did all the baking for all the other guests.